Religion is in decline in 21st Century Britain. This does not seem to be due to an increase in peoples’ understanding of science and acceptance of it as a complete explanation for life. As Richard Dawkins has observed, even non-religious people remain wedded to unscientific beliefs and the battle for science and reason is a long way from being won, even in Britain which is one of the most secular countries in the world. In a “post-truth” era, people are increasingly willing to question scientific method and accept “alternative facts” on the strength of little more than popular opinion or convenience. Further, there is no clear correlation between supernatural beliefs and religiosity in Britain. For examples, a YouGov poll in 2017 suggests that only 19% of British Christians have any difficulty accepting the Theory of Evolution through Natural Selection as a full explanation for human life and a YouGov poll in 2015 suggested that only 55% of self-identifying Christians actually believe in God! Clearly, some people claim religious affiliation and even attend a place of worship, while not subscribing to the most basic doctrines of that religion. Further, it is probably fair to say that a lot of people who do not attend a place of worship maintain religious beliefs. Nevertheless, NatCen’s Social Attitudes Survey of September 2017 made headlines when it reported that 53% – a majority – of the British public now describe themselves as having “no religion”, up from 48% in 2015 and 31% in 1983. From a straightforward statistical perspective, it would probably be fair to say that Religion will have a much smaller place in 22nd Century Britain than it does in 21st Century Britain. Of course, statistics do not provide a complete picture; they need to be contextualized and interpreted, as well as to be tested for validity. Firstly, it is wrong to infer that because the number of people with a particular characteristic in a society is small that that characteristic “has no place” in society. Consider; the percentage of people who identify as transgender or even homosexual in Britain is small. Estimates suggest that around 1% of people are gender nonconforming to some extent and the 2013 ‘Integrated Household Survey’ undertaken by the Office for National Statistics found that just 1.1% said they were ‘gay’ or ‘lesbian’ and 0.4% said they were bisexual on a sample of 178,197 British adults. This suggests that there are about 545,000 homosexual and 220,000 bisexual adults in the UK but relatively few people would accept that this is evidence for gays, lesbians and bisexuals, their issues or culture, having “no place in” our society. Secondly, the headlines of the data conceal the fact that both the religious landscape and the intensity of religiosity in Britain are changing as a result of evangelism and immigration. The numbers of evangelical Christians, of Muslims is rising and is projected to rise further in the coming decades according to Pew Research in 2015. Reasonable estimates suggest that the proportion of Muslims in Britain will increase towards 10% by 2050. Further, Pew Research in 2015 suggested that Religion is very important to more Evangelical Christians and Muslims in the US than it is to members of more traditional Churches. If the same is true in the UK, then the shift from traditional Churches towards Evangelical Churches and the increase in numbers of Muslims could signal an increase in how important religious people think religion is in their lives. While the raw number of religious people might be much lower in the 22nd Century Britain than it is in the 21st Century Britain, these people might well see religion as more important than many religious people do today. Possibly, the influence of religion will not decline as as sharply as the raw percentages might suggest it should. On this basis, Religion might still have a place in 22nd Century Britain. Thirdly, the sample size used by NatCen to gather religious affiliation and attendance data is small and its conclusions are contested. NatCen’s surveys typically draw on fewer than 2000 responses, so the margin for error on projections of proportion across the sample would be just less than 3%, with a substantially higher margin for error on projections for age-cohorts, which are sometimes dependent on excessively small samples such as the 20 responses available for the before 1920 cohort in 2008. 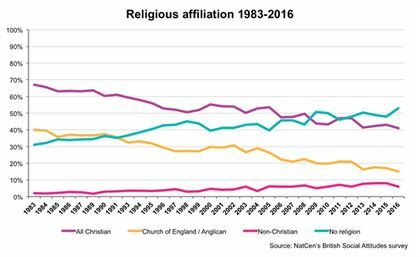 Further, UK Census data suggests that the NatCen figures for religious affiliation may be significantly lower than the actual figures. For example, in 2001 NatCen suggested that 54% of the British population was Christian whereas the Census suggested 72%. In 2011 NatCen suggested that 47% of the British population was Christian whereas the Census in the same year suggested that the figure was 59.3%. Further, by the same comparison, NatCen seems to inflate the numbers of people who are not religious even more dramatically. For example, in 2001 NatCen suggested that 41% of British people were not religious whereas the Census in that year suggested that the figure was just 15%. In 2011 NatCen suggested that 46% of the British population was not religious while the Census suggested a figure of 25.1%. Despite significant issues with the statistical evidence, it is clear that both NatCen and the Census data support the principle that religious affiliation is declining steeply and that the number of people with no religion is increasing rapidly. Projecting forward it might be inferred that religion will have died out in Britain by the 22nd Century. Indeed, NatCen’s figures suggest that the percentage of religious people has been falling by approximately 1% per year and that 71% of 18-24 year olds claiming to have “no religion” in 2016, compared with only 27% of those aged 75+. Although the margin for error in these statistics is quite sizable, on this basis it might seem reasonable to argue that the % of religious people will be negligible by the mid 21st Century and that Religion will indeed have no statistical place in 22nd Century Britain. Such a conclusion might seem to ignore the effect of age on religiosity. It is clear that as people age they tend to become more religious. Argue, Johnson and White documented this in the Journal for the Scientific Study of Religion back in 1999. They stated that… “The results show a significant, non-linear increase in religiosity with age, with the greatest increase occurring between ages 18 and 30...” (Abstract) This would make sense given analyses of Religious belief put forward by scholars from Feuerbach through Durkheim to Freud. As Feuerbach and later Durkheim noted, Religion fulfills societal needs and seems to be projected and shaped by societies for their own purposes, such as to promote conformity or a collective moral conscience. As Freud noted, a similar pattern applies to individuals, with religious beliefs and practices fulfilling psychological needs and desires for most people and so, arguably, being projected by the subconscious mind to quell anxiety. If religion is a man-made phenomenon, a natural response to personal and social needs, then it would make sense for religiosity to be more apparent in older people who are more likely to have experienced the need for community, conformity and comfort. If, as Freud suggested, God acts as a father-figure for those without a father it would make sense that belief in God would be more apparent among those who have lost their parents and are generally more lonely and isolated. If, as Durkheim suggested, religion comes into being and is legitimated through moments of what he calls “collective effervescence” then it would make sense for older people – who are more likely to have had experience of such “moments” – to believe and belong. However, once adjusted for aging, the statistics still suggest a real and significant decline in Religious affiliation and attendance. D. Voas and A. Crockett, ‘Religion in Britain: Neither Believing nor Belonging’, Sociology (2005), vol. 39, pp. 11-27 analyse British Social Attitudes by age-cohort, noting that affiliation and attendance declined markedly from cohort to cohort, but remained relatively steady in both measures across a 23 year period from 1984 to 2007 for each cohort born before 1970. In addition, for the 1970s cohort however, affiliation declined from an average 46% in 1990 (when most of the cohort would have been teenagers) to an average 28.1% in 1997 (when most of the cohort would have been starting their careers). Why the 1970s cohort were particularly susceptible to secularization during the 1990s is an interesting area for research, as is what the effects of this on the children of those in the 1970s cohort will be. However, as it stands this research suggests that both on the basis of the lower rates of religious affiliation and attendance seen in successive age-cohorts through the 20th Century and into the 21st Century and on the basis of a further decline in religious affiliation and attendance seen during the 1990s within the 1970s cohort, it is reasonable to project that in the absence of other factors, religious affiliation will decline towards zero over the next century. Yet what might these “other factors” be and how might they still affect the place of religion in 22nd Century Britain? One factor might be apparent in NatCen’s figures for the 1980s cohort rates of affiliation, which rose from 32.6% in 1997 (when the cohort were mostly teenagers) to a high of 39.2% in 2001, before returning to 32.3% by 2007 (when most of the cohort would have been in their 20s). The short-lived spike in religious affiliation within the 1980s cohort around 2001 is mirrored within the 1950s and before 1920 cohorts, but was not evident in the attendance figures… apart from for the before 1920 cohort, who seem to have attended places of worship in 2001 and again in 2005 in significantly higher numbers. It is tempting to interpret the correlation between higher church attendance among elderly people and big terrorist attacks as having some sort of causative explanation. Going back to Feuerbach and Freud, perhaps the shock of 9/11 and 7/7 caused people to seek solace in religion? Going back to Durkheim and thinking about Marx, perhaps the trauma of the attacks and the “war on terror” can explain the need for a collective religious response, both practically and politically. If religion is the “opium of the masses” it would be reasonable to see more of it being used – rightly or wrongly – when the masses are in real pain! Nevertheless, if the breakdown of the statistics is anything to go by, the statistical spike was not demographically uniform and nor did changes in affiliation rates translate into attendance. Only the oldest people actually attended a place of worship more often in 2001 and in 2004-5; there is no apparent change in NatCen’s attendance figures for younger people and the attendance of the 1960s cohort actually dropped in that year and in 2005. Perhaps the statistical spike in affiliation in 2001 and around 2005 is more to do with expressing solidarity, cultural and moral identity and to do with asserting hope in a seemingly hopeless situation, than it is to do with any actual change in what people believe or do in terms of religion. In part, this seems to confirm Max Weber’s suggestion that religion emerges out of peoples’ need to respond to the injustice of evil and suffering and out of their need to believe in salvation and that something they can do could lead to a righting of this injustice. What might the principle that people might be willing to state religious affiliation in greater numbers at times of social stress suggest about the place of religion in 22nd Century Britain? Just that religion will probably continue to have a place in 22nd Century Britain and that then, as now, that place will be more apparent at times of national crisis and when people feel the need to assert control over their fates. Further, the population is aging. This trend might be interrupted or even reversed by the reduction in antibiotic efficacy, the increase in cancers, the growing likelihood of pandemics as well as by decades of under investment in health and social care etc, but if it continues even at a slower rate, the proportion of very elderly people in the 22nd Century Britain might well be larger than it is today. Sadly, a higher proportion of very elderly people is likely to result in a higher proportion of people suffering from poverty, loneliness, isolation and depression, all of which are indicators for higher rates of religiosity. In “Religion and depression: a review of the literature” (1999) McCullough and Larson found that… “some forms of religious involvement might exert a protective effect against the incidence and persistence of depressive symptoms or disorders.” Surveying more than 440 pieces of research, in “Religious and Spiritual Factors in Depression: Review and Integration of the Research” (2012) Raphael Bonelli et al found that “Religious beliefs and practices may help people to cope better with stressful life circumstances, give meaning and hope, and surround depressed persons with a supportive community.” According to a 2008 study, people who are lonely are more likely to become religious while rates of loneliness in the UK among older people are high and arguably rising, perhaps as a result of families dispersing and the long hours worked by British people. These studies seem to support Freud’s suggestion that Religion can often help people to cope with voids in their lives and Jung’s suggestion that religion is about much more than a world-view or a set of rituals and is better understood as a process of working out our relationship with reality. In addition, Gallup research in 2009 found that Religion is typically far more important to the population in poorer countries than it is in richer countries and that there is a direct correlation between economic prosperity and religiosity. If rates of religiosity in Britain have a relationship with the economy, then the place that religion has in 22nd Century Britain may depend on the long term economic future of the country. Of course, the relationship between religion and economics was charted more than 100 years ago by Karl Marx and then by Max Weber, who both understood how religion can function as a tool of capitalism which keeps ordinary people motivated and engaged with the market and the political system which puts it first when it singularly fails to benefit them. Of course with Brexit on the immediate horizon, continuing problems with managing the deficit and the housing market, the national debt and the longer term effects of world population growth, climate change and resources depletion, it is difficult to forecast what the economy will be doing in five years time, let alone into the 22nd Century. It could be that Capitalism will collapse before that time; Marx predicted that it will. Suffice it to say that there is a real possibility that Britain will be poorer in the future, and that with the decline in its finances the country could see an increase in the number of people expressing religious affiliation… and even attendance (assuming that places of worship continue to function for long enough to benefit from an upturn in numbersthat is). In conclusion, the claim that religion will have no place in 22nd Century Britain is exaggerated. While religious affiliation will probably continue to decline, part of this effect may be offset by an increase in religious intensity among those believers who are left, by temporary increases in religiosity at times of national crisis and by the probable effect of a potentially aging and in any case stressed, sick and impoverished population. Further, even with a small proportion of religious people, there will continue to be a place for religion in British society as there are places for other minority ways of life. Clearly, the decline in religion will raise questions about the established status of the Church of England, the representation of religions in the House of Lords and about the protected status enjoyed by religions in relation to tax and education for examples. How these questions are handled will have some effect on the place religion will have in 22nd Century Britain. Charlotte Vardy will be proposing the motion “This house believes that religion should have no place in 22nd Century Britain” as part of Candle Conferences’ “Outstanding A Level Religious Studies” events across England during November 2017.